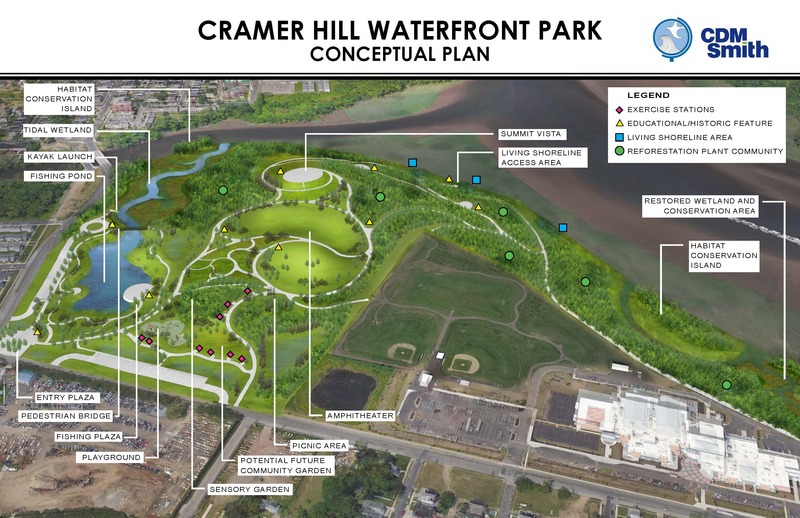 The Office of Natural Resource Restoration (ONRR) is transforming 62 acres of the former Harrison Avenue Landfill into the future Cramer Hill Waterfront Park. This effort is being performed in conjunction with the Division of Coastal Engineering (DCE) and the Camden Redevelopment Agency (CRA). The project includes shoreline protection, landfill closure, natural resource restoration, and park construction. ACTIVITIES UPDATE: Site preparation and tree removal began in March 2018. Site preparation efforts continued into mid-May 2018 when operations shifted focus to performing earthwork activities comprised of excavating, relocating, grading, compacting, and covering the landfill materials. These activities are reshaping the site’s base elevations and will establish the final subgrade contours of the park. The earthwork activities are almost 75 percent complete based on the amount of excavation, or cut, performed to date. Please note that the construction of the final cap for the landfill is not included in the estimate of completed earthwork. While the final cap construction involves placing large volumes of clean fill materials on top of the landfill, this task is tracked as a separate task for the project. Completed work includes installation of reinforced silt fencing, perimeter fencing, project signs, a truck wash, turbidity barriers along the Delaware River shoreline and in Cooper River, a second construction entrance on Harrison Avenue, the tree stump barrier wall along the northeastern property line, the dewatering system for the fish pond area, the water treatment plant, the coffer dam in Cooper River, and the fishing pond weir; construction of the trailer compound, equipment storage corral, and the temporary dewatering treatment plant area; removal of all trees including those within the habitat conservation areas (HCAs); removal of waste/contaminated soil within 2 of the 3 HCAs; relocation of freshwater mussels from the coffer dam area in Cooper River; and preparation of the clean fill material storage areas. Ongoing work includes remaining earthwork activities which are currently underway in the fishing pond area; Delaware River shoreline stabilization including planting of live stakes within the next 2-3 weeks; installing the dewatering system for the tidal wetland kayak channel; operation, maintenance, and monitoring of the dewatering system and treatment plant; maintaining site access and environmental controls; routine cleaning of storm drains and removal of litter from E. State Street and Harrison Avenue; conducting air monitoring, dust suppression, and odor control; monitoring worker health and safety; completing all restoration work in the HCAs; equipment mobilization/demobilization; material deliveries; and off-site disposal of used tires. Work planned for upcoming months includes installing the steel piles and abutments for the pedestrian bridge; preparing subgrades for the Delaware River tidal wetland channel and Delaware River Outlook areas. BACKGROUND: The former 86-acre municipal landfill is in the Cramer Hill neighborhood of Camden, at the intersection of Harrison Avenue and East State Street where the Cooper River flows into the Delaware River. The landfill operated from approximately 1952 to 1971, but it was never capped or officially closed which left the site subject to unauthorized dumping in subsequent years. In 2006 The Salvation Army applied $59 million it received from the estate of Ray and Joan Kroc to construct the Kroc Community Center on 24 acres of the landfill. The Kroc Community Center opened in 2014 and serves over 8,000 residents. The NJDEP provided $22 million of Hazardous Discharge Site Remediation Fund and another $4 million in public funds during 2006-2014 to remediate the landfill. ONRR has allocated another $47 million in natural resource damage settlement monies to transform the remaining 62 acres of the landfill into the Cramer Hill Waterfront Park. Please refer to the “Schedule” section below for information on the bidding milestones and construction schedule. 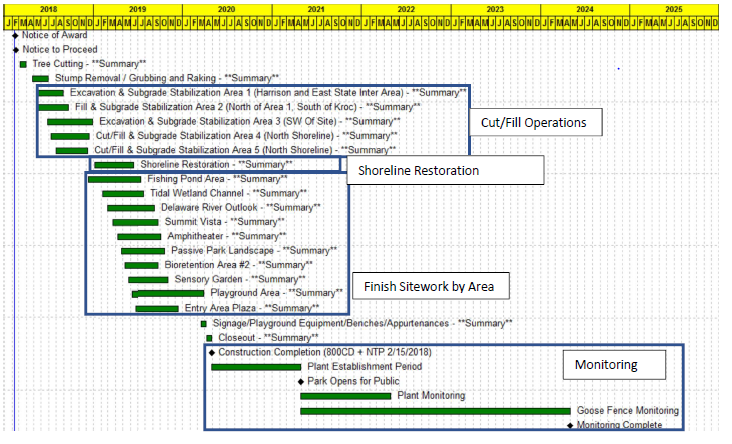 PROJECT SUMMARY: Managed by the ONRR, the 62-acre project has 4 main components: shoreline protection, landfill closure, natural resource restoration, and park construction. The shoreline protection involves regrading and stabilizing over 3,000 feet of shoreline on the Delaware River where municipal solid waste and soil contamination including pesticides and PCBs are exposed on the surface of the unstable, steep slopes in this area of the landfill. The landfill closure involves excavating and redistributing about 375,000 cubic yards of solid waste and soil onto the center of the landfill, installing a passive gas venting system, and constructing a 2-foot thick semi-permeable cap of clean fill material and vegetation. Natural resource restoration involves enhancing and expanding the existing freshwater wetlands by constructing approximately 7 acres of tidal freshwater wetlands on both the Cooper and Delaware Rivers, creating 450 feet of living shoreline in 3 areas along the back channel of the Delaware River, preserving 3 areas of existing trees as bald eagle forage habitat, re-planting trees within the remainder of the bald eagle forage habitat including an area where large, specimen trees will be planted. Over 375,000 plantings are included in the project. The tidal freshwater wetland on the Cooper River will connect to a fishing pond that will also be a prominent feature of the waterfront park. The waterfront park will include features such as an amphitheater, an entry plaza, exercise stations, a fishing plaza, hiking/biking paths and trails, historic/educational signage, a kayak launch, a picnic area, a playground, a sensory garden, shoreline observation areas, and a summit vista with panoramic views of downtown Camden, the Camden Waterfront, the Delaware River, Petty Island, the Benjamin Franklin Bridge, and Philadelphia. SCHEDULE: The DCE issued a bid solicitation on December 1, 2017 and awarded the contract to JPC Group, Inc (JPC) on January 30, 2018. The DCE executed a contract with JPC and issued a Notice to Proceed on February 15, 2018. Representatives from the City of Camden, CRA, Coopers Ferry, the Camden County Police Department, the Salvation Army, CDM Smith, JPC, DCE, and ONRR attended a February 23, 2018 pre-construction meeting. JPC began construction on March 5, 2018 and progress continues as described in the “Activities Update” section. ONRR and CDM Smith will manage the various stages of the construction phase which is tentatively scheduled for completion in the April 2021 when the park will open to the public and be turned over to CRA. ONRR and CDM Smith will also manage JPC’s warrantee monitoring periods and overall compliance with land use permit mitigation requirements into 2025. A summary of the project schedule is shown below. STAKEHOLDER INVOLVEMENT: ONRR invites stakeholders to attend monthly partnering meetings to which provide the opportunity for ongoing public participation with the project. The stakeholder group is comprised of representatives for the entities listed above. The meetings began in March 2018 and we plan to continue holding them for the duration of the project. ONRR also hosted two public information sessions at The Salvation Army Kroc Center. The first was held on July 24, 2017 to introduce the design plans to the community and the second was held on June 25, 2018 to update the community and stakeholders while construction was underway. Project pictures and videos showing the progress of construction activities may be seen on our gallery page. Please email questions or comments to onrr@dep.nj.gov.